Vico was at odds with the prevailing climate of the eighteenth century, which felt that truth about the universe could be arrived at rationally. This idea of a 'clockwork' universe, a mechanism entirely accessible to human understanding, remained so persuasive that by the late 19th century prominent scientists were all set to dot the last 'i' of the last law of physics and declare that discipline defunct. Then along came our own century with such things as Relativity, Uncertainty Principles, Quantum Indeterminacy, and Gödel's Theorem. Kurt Gödel showed that mathematics—and, hence, logic—was not the perfect standard of precision that it had appeared to be. Two centuries earlier, Vico, completely out of step with his contemporaries, had not been comfortable with the Aristotelian ideal of perfect deduction from first principles and had said that even mathematics did not—could not—contain the certainty that philosophers such as Descarte would have liked. The so-called "truths" of mathematics were true only because the rules governing mathematics were man-made and arbitrary. Thus, Vico was somewhat of a harbinger of revolutionary twentieth-century scientific philosophy. 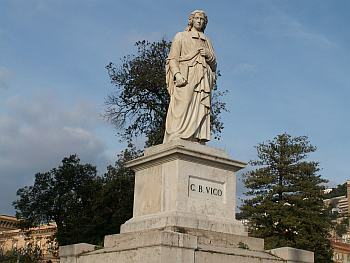 Something else that made Vico different from his fellow philosophers was the emphasis he placed on the study of history. To someone like Descartes, history was little more than a messy collection of human absurdities, hardly the stuff worthy of true scientific enquiry. To the extent that Enlightenment philosophers worried about the nature of society, it was, again, to discern the "natural laws" that governed human beings, just as, indeed, natural laws governed the movement of the planets. Also see this entry on Vico and the Homeric Question. Also see this entry on the Giambattista vico Foundation.